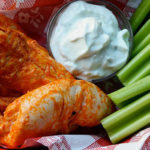 This recipe for healthier Buffalo Chicken Tenders with Blue Cheese Dip is finger-lickin’ good and better for you than your average basket of wings. These tangy, spicy buffalo chicken tenders are the perfect dish for setting out before a big game or at your next potluck. You can drench these babies in your favorite hot wing sauce dip ’em in our creamy blue cheese sauce and easily forget they’re only 158 calories per serving! These tangy, spicy chicken tenders dipped in creamy blue cheese sauce are delicious enough to make you forget they're only 158 calories per serving. Combine 1 Tbsp. hot sauce, vinegar, garlic powder, paprika, and cayenne (if desired) in a small bowl; mix well. While chicken is baking, combine yogurt and cheese in a small bowl; mix well. Set aside. Add veggies to make this a great snackional. *Note on equivalents: Per serving, the amount of yogurt and cheese found in this recipe is not enough to count toward a day’s red or blue allowance. As such, these ingredients (and calories) have been calculated into the tsp. equivalent.